I have a dream of making an AK my primary rifle. That being said I’m not a fan of its ergonomics. I’m not a purest and I don’t really care if I offend any that are. I consider a rifle (any of them) a tool in the shed and if I can create a better tool for me, then I’m all over it. 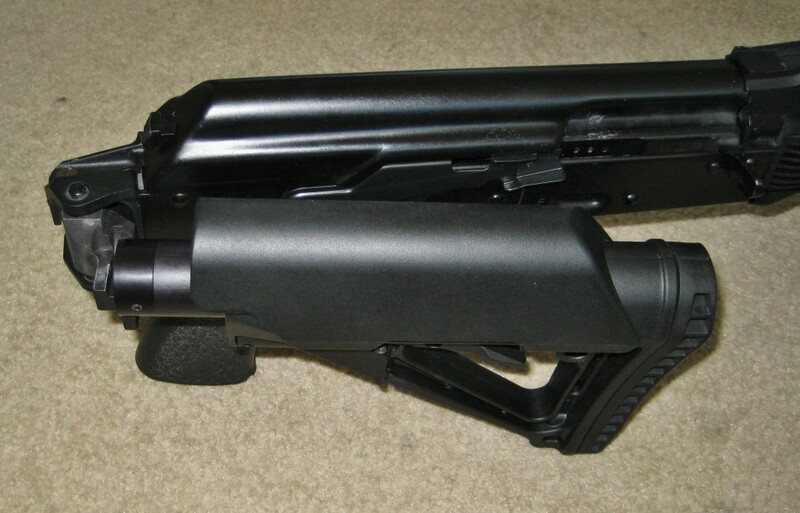 When I got the M10 I was thinking of leaving on the Romanian folding stock and adding a amd65tech cheek riser. After the dream of the M10 faded and I went with the SGL31, I looked around at the folding stock options and they were expensive. Looks like the days of $40 folding wire stocks are gone. 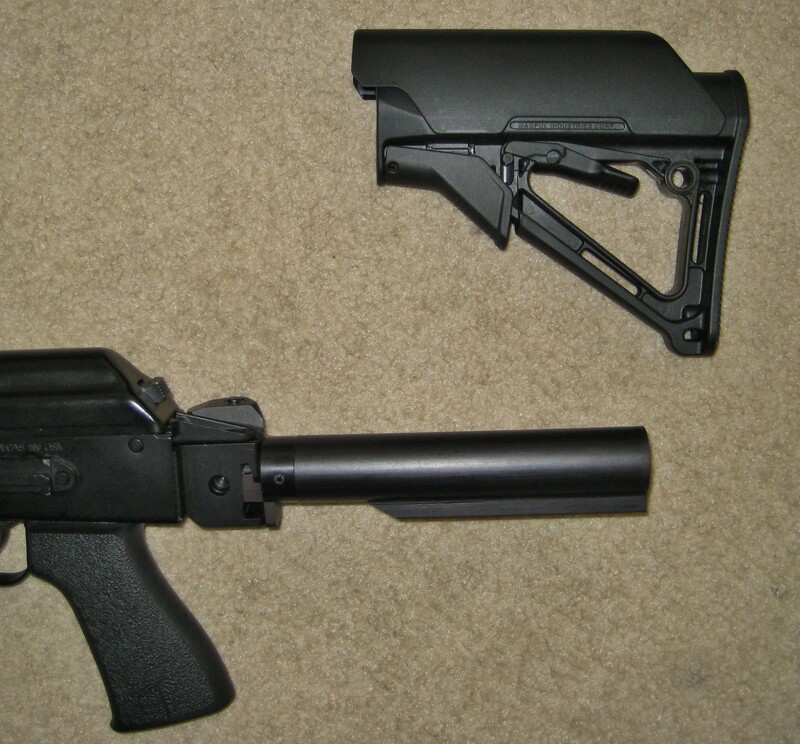 Right around this time, OST (One Source Tactical) came out with a folding knuckle for a commercial buffer tube that would allow you to put a magpul stock on it and make it a folder. A sweet piece to the puzzle is you don’t have to cut off your tang to go with this folder. 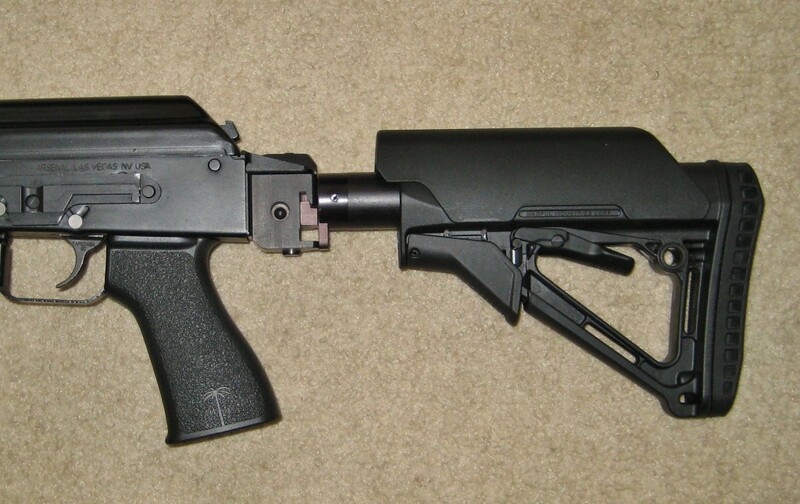 What is brutal for me, is I had a magpul milspec CTR stock sitting around without a home that I wouldn’t be able to use, but the folder looked interesting. As all things OST there were no specs or weight (drives me nuts with that site). Anyways I pre-ordered as it looked to be an OST exclusive. OST was saying at least a month before they would ship. A couple weeks ago CNC Warrior and Bonesteel Arms looked to be putting out the same knuckle and they also had an option for one with an integrated milspec buffer tube attached. Price was a little more but was worth it for the milspec tube. Another nice addition was Bonesteel was including a ship date. So I canceled my order at OST and placed a new one with Bonesteel Arms for the knuckle with the milspec tube. Nothing against OST they just didn’t have the integrated tube and I didn’t feel like adding a tube and castle nut. Anyways, long story on trying to get the part shipped out but I finally got it last Friday. The install was a breeze, except for the never-ending screws Arsenal attaches their stocks with. All screws are included. The included screws are flat head. I would have perferd an allen or torx but they work. There is a threaded hole for a screw that mounts through the tang and also a slot for a screw with a nut that allows for variances of receivers – It’s actually quite a brilliant setup. I would highly recommend Loctite. Folding is actually quite simple and sweet. You push down directly at the hinge and it folds over like butter. Chris at Bonesteel has said that the hardened steel bushing around the hinge pin prevent wear, and the rest of the mating points are designed to lock up even tighter as wear ensues. The hinge is rock solid and has no play in it at all. The Krebs safety gets in the way a bit but its not a deal breaker for me. I think I will end up customizing the CTR so the Krebs will lock into it. One really excellent addition to this buffer tube is each hole has a threaded hole behind it for a cap screw to set a preset position. I love this option as I would never go beyond the third hole and this allows me to add a stop so your not constantly trying to find the right position. The tube has 6 holes that are all evenly spaced, and all positions are useable. Randomly I actually had one of these stops laying around. I love this option and works out perfectly. If my research is correct, at just 10.5 ounces, this is the lightest way to attach a folding collapsible stock to your AK. Another nice addition is the extra deep q/d sling swivel pocket on the knuckle. 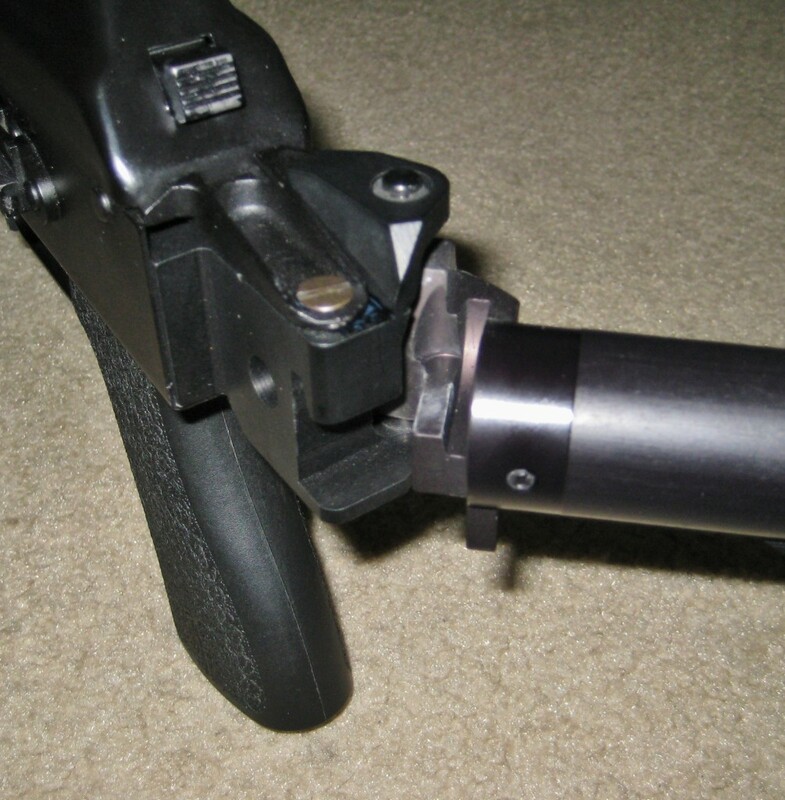 This puts a sling mount right about the same spot as an AR, which is nice if you use a single point sling. At this point I’m a super happy and now I’m just trying to figure out what rail system to replace my handgards with. 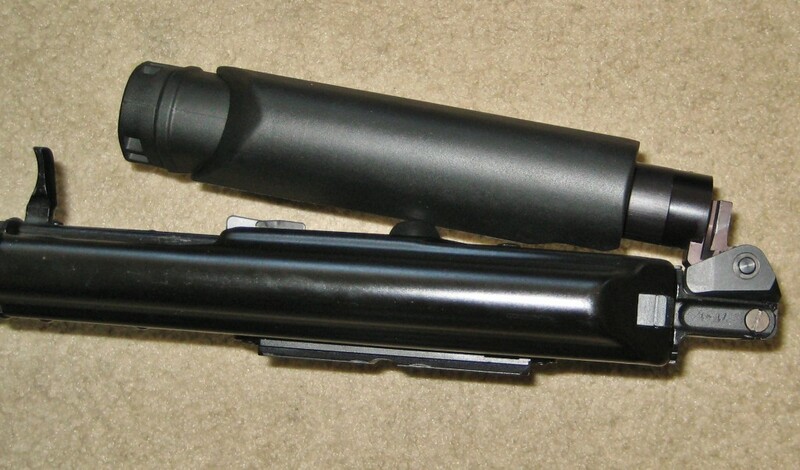 Again, OST has some great options like the Texas Weapon Systems Kalashnikov Handguard. The setup is sweet. I now have the ability for a CQB length and also a long range length. If you have an AR background I can’t begin to tell you how the rifle just comes alive with this setup. I would highly recommend getting the .75 cheek riser as the stock sits a little low. In the end I think it’s a even trade with the original stock to the folder. Any actual stock you add after is going to be a weight gain. I ended up adding a little less than half a pound but I plan on making that up in other areas. You can buy the knuckle alone or the knuckle with the built in tube. The Bonesteel Arms folder with the tube is a great option in my opinion as it’s far cheaper than buying a decent tube and castle nut. Chris at Bonesteel was great to work with. It’s really a great product that does everything that OST, CNC Warrior, and Bonsteel are saying. Clearly it’s one of those items that require a follow up review to see how the hinge is doing after hundreds of folds. Now I have the option of a more discreet case for the SGL. When I first threw this on I was a little worried about the weight and the thickness of the stock. I have to say that after shooting it all weekend it is a dream to shoot. My groupings are tighter and the gun seems faster to target. I really love this hinge and can’t say enough about it. If you are looking to go this route and don’t want to cut off your tang, I think it’s the way to go. Thanks for your review on this! I actually have one of the CNC sidefolder mechanisms on order now. Strangely enough, I went down the road you did but got an M-10 (with a fixed stock – there was a mixup when I ordered). I wanted a folding mechanism that let put on a Magpul MOE stock without having to saw my tank off and this seems to be it! 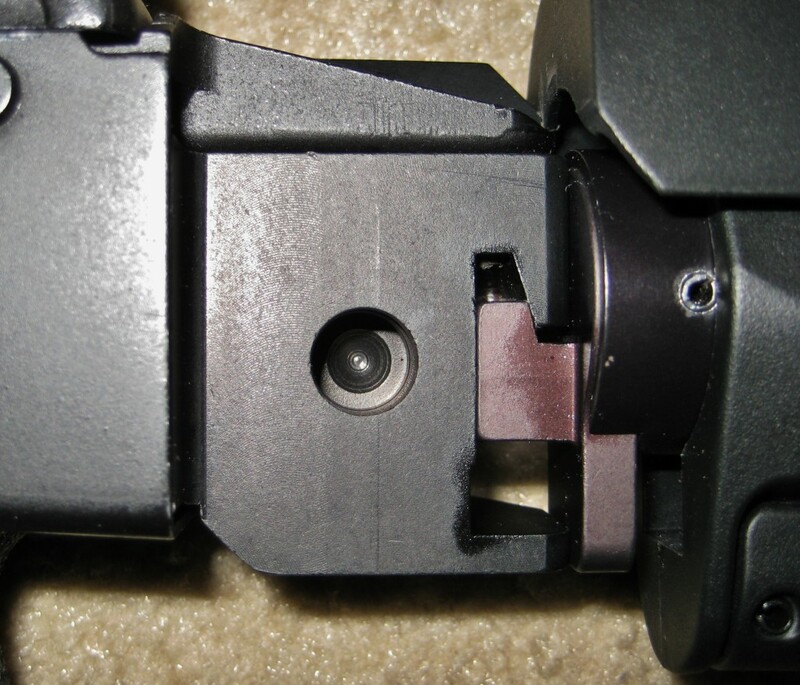 Once I add that on I am looking to put on an Atteros Arms PA redot mount that replaces the default iron sights ( http://atteroarms.com/products.html ). I know there was some sort of scandal about them self promoting their gear or whatever, but a guy on my messageboard reviewed one and said it was great. Sadly, they are out of stock. I am glad to see there is someone else out there who considers their weapon a tool and isn’t concerned about throwing AR parts on there or looking ‘tacticool’. Thanks for the blog and the review! The folder by the way is awesome! I was a little worried on wear as in the beginning it kind of eats away at itself to find its groove (you will see what I’m talking about when you get it) but after that initial break in it has been stellar. I use the folder far more than I thought I would. Chris at Bonesteel did a hell of a job on the design. Super happy with it! AK Talk did a review of the Strike Industries AK Rail and I think he has been happy with it. 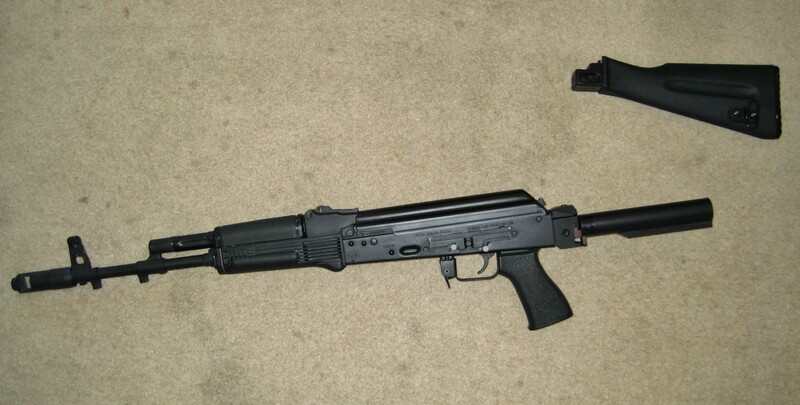 You may want to check out his review – http://ak47talk.blogspot.com/2012/03/strike-industries-ak-rail-first.html. Be great for you to come back and let us know how your build works out and if you want to do a guest post for us on the topic we would love to post it. Enjoy your M10! Thanks – I saw AK Talk’s review of the Strike Industry’s rail and for me, it just sits a little too high for my tastes (aesthetically) – I like the Midwest Industries mount over the SI one. Once I get my build all finished up I will be happy to write something up, thanks for the offer! what size “stopper” or screw did you use for that memory stop on your stock? Kevin – It was a 4.5mm stop that came with a set of scope rings I have. If you can’t find one, I would ping Chris at Bonesteel Arms and ask him if he can get you one or at least point you on the right direction. The Bonsteel stock is held in place by spring tension. It does not technically lock in place like the Russian folders with a button to release. 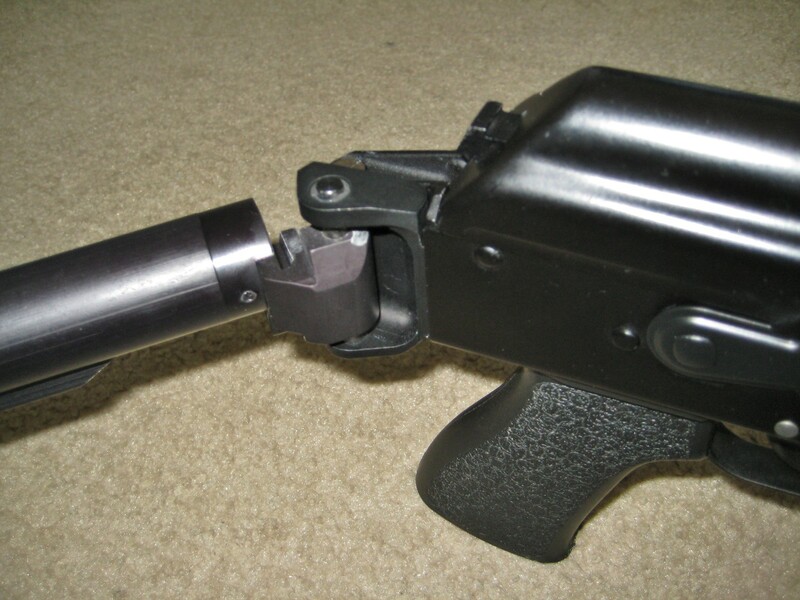 Accessing the trigger is dependent on the length of the stock when folded as its on a traditional buffer tube. At the second position it is not in my way. The Krebs safety only slightly interferes but I don’t see it interfering any more than the side rail would if you went with a left folder. Every other review on this setup was lacking. You just sealed the deal for me on this. Thanks! !